In this article, we are going to tell you which are the Best VPN for iPad users in 2018. Tablets are taking over. More and more of us are choosing to use a tablet rather than a laptop or desktop computer for everything from browsing the internet, streaming TV and movies, and gaming. And the king of the tablet is without question Apple’s iPad. And with the iPad becoming so omnipresent and online threats continuing to grow, it is little wonder that VPN use of iPads is on the rise too. Users are seeking to protect their privacy and security online and a VPN is the best way to do it. Apple sold an astonishing 43.8 million iPads in 2017. This is more than rivals Samsung and Amazon managed, combined. Marketing experts estimate that around Apple held a 26.7% share of the tablet market, which is an improvement of 2.5% on previous years. But while sales remain buoyant, Apple’s reputation as a whole has not had such a smooth ride. As well as a few notable PR disasters, the company has also lost the myth of total security that its devices once held. The FBI announced last year that they had managed to hack into the iPhone of the San Bernardino terrorist, and Apple themselves admitted that their devices affected by the Spectre vulnerability. Their compliance with the Communist regime in China has also raised questions about just how much Apple really protects its user privacy. The days when people would buy an iPad and assume that it was a secure and private device are gone. People now realise that, just like any other tablet, they need to take steps to secure their iPads too. And this is where a VPN comes in. Last year, our editor picked IPVanish as his Best VPN in 2017 and so far in 2018, he has seen no reason for it to be knocked off the top of the pile. This is as true for iPad users as it is for anyone else. IPVanish offers a superb dedicated app for the iPad, which allows users to protect their online activity with just a single click. IPVanish has plenty more going for it too. They have a no user logs guarantee that you can trust as well as state-of-the-art encryption which matches the best any of their major rivals can offer. This means you can be sure online activity is secure and private when connected to IPVanish. IPVanish also has a large network of servers in locations all around the world, meaning you can connect to a local server and unblock geo-restricted content from just about anywhere in the world. There are no limitations on bandwidth or file types you can use either. And crucially for iPad users who like to stream media content, their connection speeds are consistently fast and reliable too. There is little to fault about the IPVanish VPN offering, which is why it is so highly regarded by users and VPN experts alike. The VPN provider which has come closest to knocking IPVanish off its perch is ExpressVPN. And this is as true for iPad users as any others. ExpressVPN offers a dedicated iPad app which is beautifully designed, easy to use, and also lets you get connected with just a single click. ExpressVPN is headquartered in the British Virgin Islands, and one of the benefits of this is that they can offer perfect privacy protections thanks to local laws. This means their zero user logs policy is a cast-iron one. Their encryption is also as good as it gets and on a par with what IPVanish offers. The ExpressVPN server network is one of the biggest of any major VPN provider, with servers available in no fewer than 94 different countries. This makes them one of the best VPN providers for unblocking geo-restricted or censored content. The only real negative point we have to make about ExpressVPN is its price. It is a little more expensive than most of its main rivals and, while some are willing to pay a little more for their great service, it definitely does keep others away. But with our exclusive offer, you can get ExpressVPN for less and start enjoying all the benefits of a great VPN provider. NordVPN is another VPN which has been around a while and its stock has risen further in recent months thanks to the investment it has been making into its infrastructure. NordVPN used to be thought of as slower than some rivals, but that is no longer the case as it has upgraded and replaced a great many of its extensive range of servers with new super-fast hardware. This means their connection speeds and reliability is now up there with the very best. They offer a beautifully designed app for iPad users which offers most of the features of their desktop Mac one on the tablet computer. This includes one-click connect as well as extra security features such as Double-Hop VPN and VPN-over-Tor, which other providers don’t offer. NordVPN is also based offshore (in Panama) which means that, like ExpressVPN, their privacy provisions are as robust as its get. Their encryption too is on a par with all the other providers we are recommending for IPVanish users. 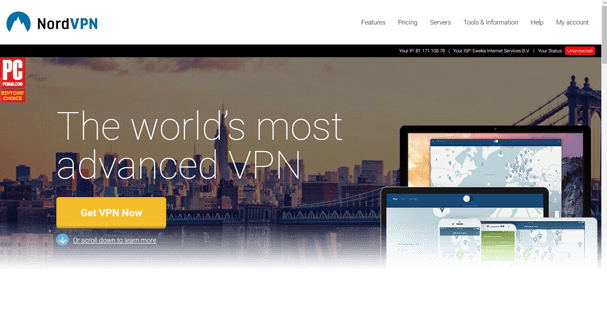 Perhaps the biggest draw to NordVPN is their highly competitive pricing, which undoubtedly makes them one of the most cost-effective providers around. And with our special offer, you can save even more. CyberGhost is a VPN provider which offers a quirky logo and a tongue-in-cheek design. But this façade masks a seriously good VPN service which is great for VPN novices and ideal for iPad users. Like NordVPN, they too have been investing in their infrastructure of late and now offer servers in more than 59 different countries, which is significantly more than before. They offer reliable encryption and privacy policies that you can trust, and their dedicated iPad app is both fun and easy to use, with a very neat and intuitive design. This makes it a perfect place for VPN novices to learn the ropes. Their service does not yet quite hit the heights of some others on this list. Connections speeds are sometimes variable, although they have made great strides in this area too. But with their affordable prices and huge 30-day money-back guarantee, there is no reason not to give them a try. VyprVPN is another well-regarded provider that offers a great all-around service for iPad users at an affordable price. They also offer a 3-day free trial, which means anyone can try their service with no obligation before committing to buy. VyprVPN is a provider which focuses on offering top-level encryption. This includes their unique Chameleon encryption protocol, but this is only available for Premium subscribers. They combine this with decent privacy policies which include no activity logs, but unfortunately, they do admit to retaining some connection logs, which some users will worry about. Aside from that, there is much to praise about their service. Their dedicated iPad app is well-designed and easy-to-use, and they offer fast connection speeds too. This is the case across their entire server network, which now offers connections in more than 70 countries around the world. VyprVPN is not perfect, but it still does enough to warrant a place on this list and we have no doubt that many iPad users will be more than happy with the service they offer. If you are wondering how to choose the best VPN for iPad, then you have definitely come to the right place. With more than a thousand different VPNs provider currently in the market, it is clear that many consumers need help in identifying the best one for them. That is where we come in. Here at VPNCompare.co.uk, we regularly review all the best VPN providers to ensure you can easily find all the latest information about every major VPN provider. It is strongly advisable to read up on your VPN provider before you sign up with them. This is because while many VPN providers offer an honest and trustworthy service, there are always a few unscrupulous ones who don’t. And this is where we can help. So, if you want to know the best VPN for iPad users 2018, then you need look no further than the five we have recommended above. And if you are in a real hurry, then our number one recommendation is IPVanish. How do I install a VPN on iPad? If you are not particularly technically proficient, then the idea of having to install and set up a complicated-sounding bit of software may sound daunting. Don’t worry. It is very simple, and we are always striving to take away any stress or concerns you may feel. In most instances, there are two different ways you can install a VPN onto your iPad and get it up and running. And these will be broadly the same regardless of which VPN provider you opt for. The most commonly used and easiest way is to use the dedicated iPad app provided by all of our recommended VPN services and many more too. And unless you live in China, you will be able to find and download these from your local App Store, just like any other app. 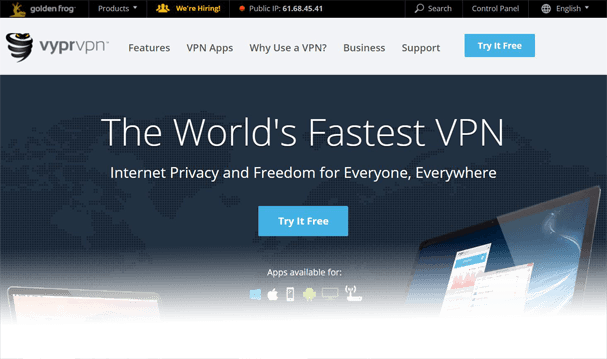 To use this VPN app, you will first need to visit the provider’s website, which can be done quickly and easily using the links on this page. Follow the instructions to sign up with them and then input the account details you have been given into the app. This will log you in and once you have done that, you should be able to connect to your closest VPN server with a single click. You can then play around with the settings to configure it to your own requirements if you so wish. It is also possible to set up the VPN connection manually. Most VPN providers will offer detailed instructions on how to do this on their website, but for the majority of customers, this is unnecessary as the app offers everything they need and more. Whether you are using your iPad while at home and connected to your local Wi-Fi connection or out and about using mobile data, your VPN will be protecting you. As long as you have connected to your VPN server, it will be protecting your device and your data whenever you are online regardless of the type of internet connection you are using. A VPN works by redirecting all of your internet traffic through an encrypted tunnel and via their servers, before sending it to its intended destination. This process is unaffected by the type of internet connection you have. So, you can use your iPad at home, on the move, or even when connected to public Wi-Fi with confidence once you have signed up for a VPN. The iPad is undoubtedly the pick of the tablet computers on the market at the moment. But with the idea of Apple’s security being fool-proof now exposed, a VPN is as important for iPad users as anyone else. A growing number of iPad users are beginning to realise this now and VPN use with the device is on the rise. There are no shortage of providers to choose from and many offer dedicated iPad apps which make the process of downloading, installing, and using a VPN with your iPad easy. 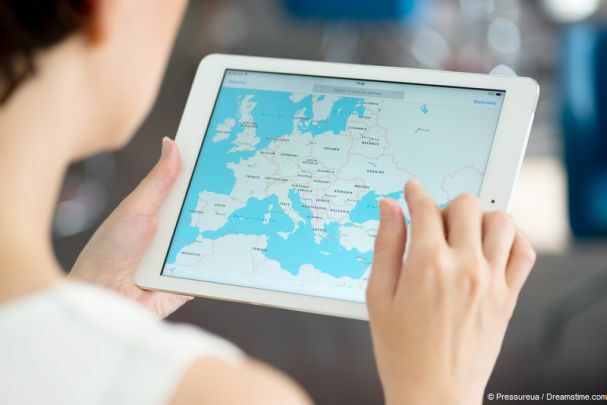 But the market for VPN providers remains a crowded one, which is why we have done the legwork for you and identified the five best VPN providers for iPad users in 2018. Any one of the providers listed in this article will offer you an impressive level of service. But our recommended VPN provider for iPad users in 2018 is, once again, IPVanish.